In the town of Rochefort, twin sisters Delphine (Catherine Deneuve) and Solange (Francoise Dorleac) Garnier hope to meet their true loves. Meanwhile, their mother (Danielle Darrieux) pines after her long-lost fiance (Michel Piccoli); an American composer (Gene Kelly) is smitten at first sight with Solange; an artistic soldier (Jacques Perrin) paints a portrait of his ideal woman (who looks just like Delphine); and carnies Etienne (George Chakiris) and Bill (Grover Dale) convince Delphine and Solange to perform in their show before heading to Paris. Four years after the success of their all-singing musical The Umbrellas of Cherbourg, Jacques Demy and his wife Agnes Varda directed this vibrant romantic homage to Hollywood musicals, based on the notion that true love is waiting just around the corner (if only we’re lucky enough to stumble upon it! ), and that an “ideal mate” exists for everyone. 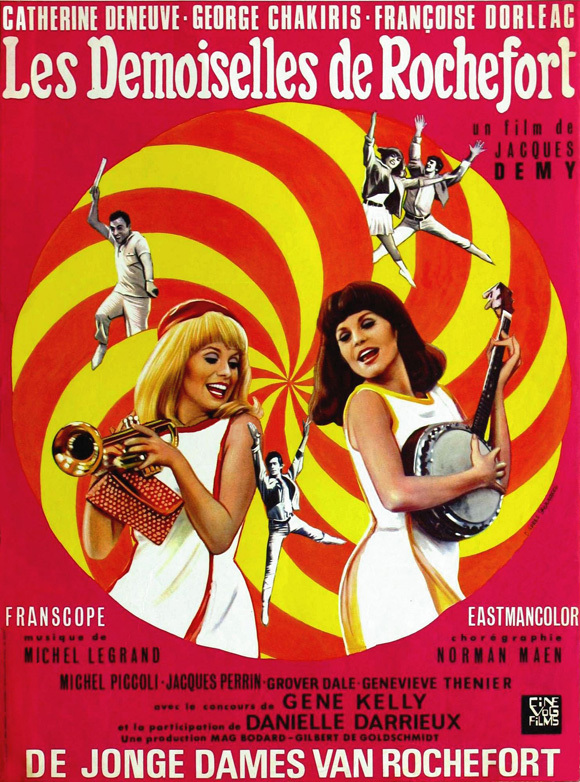 It’s playful, colorful, irreverent (a minor subplot about a murderer is thrown in, just for kicks), and jazzy, thanks in large part to both Michel Legrand’s inimitable musical touch (his soundtrack literally permeates the proceedings) and the creative team behind the film’s stylized production design. Equally infectious is the dancing, with George Chakiris adding a light touch to every step he takes (those white boots! ), and Gene Kelly — looking nothing close to his age of 55 — serving as inspired casting (Demy apparently waited two years until Kelly was available to participate in the film). Deneuve and her real-life sister Dorleac (who died in a car accident before the film was released) are also perfectly cast as the fraternal Garnier twins — their initial song together (“Chanson Des Jumelles”) is a delight. Fortunately, Demy moved away from the gimmick of Cherbourg (which was entirely sung), and was more flexible here with his dialogue: some is sung, some is rhymed, and some is simply spoken; though purists may disagree, I find this ultimately more successful. As with all musicals, Rochefort will not be to every film fanatic’s taste — but it’s certainly must-see at least once. Yes. While not for all tastes, this is one of Demy’s masterpieces and should be seen by all film fanatics. What captures me most about ‘YG’ is its celebratory tone. Almost throughout, the joy in the film is infectious. Even though you suspect where the film is more or less going early on, it’s still fun watching how it all plays out. Deneuve and Dorleac’s numbers are all highlights; the first in particular, as well as the one at the fair – which seems, in part, a nod to Monroe and Russell’s ‘Two Little Girls from Little Rock’. Certainly the film’s oddest inclusion is the off-screen murder, though it does serve to keep the film grounded in a reality not completely colored by affairs of the heart.